If you want to know the real reason I need a large craft room or area it's because I have so many projects that I haven't started or haven't finished. It's not my tools that take up the space, or even my sewing machine and serger. Nope. It's all the things I have on a list of projects. Last week I actually went through almost all of my craft things. This was because it was moved out of the old guest room so we could give our growing son the bigger bedroom and prepare for the second baby. It was so much work. I re-discovered things I had forgotten about. Like the skirt that I made for myself 4 1/2 years ago, but never finished because it was too small. Or the pajama bottoms I had cut out but never got farther than that. The quilt I began for my son, still unfinished. Scrapbook pages I have yet to put together, and oh so much more waited for me in my piles. My true identity became very clear to me. 1. I should really never be in charge of something major. Like a girls night out or a wedding dress. 2. I should not be allowed to shop. Period. I'd say just at craft/hardware stores, but pretty much any store can be dangerous. Trust me. 3. I shouldn't blog. This habit causes serious delay as I take pictures of the before, during and after. It also takes precious time. And yet I won't stop, don't worry. 4. I shouldn't read other Home Decor/Craft/DIY blogs. It makes me want to do more. 5. Projects shouldn't take priority over dinner or cleaning. Yet they often do, and seldom get finished. Sorry Honey. 6. Productivity in front of the TV is minimal. Even if there is something I could do while watching. I can't even knit while watching TV. 7. There are things that always need to be sorted through: Papers, crafts, mail, boxes of junk, etc. 8. Distraction by a craft idea or project is always welcome when the alternative is not interesting (ie. All the random phone calls, grocery shopping, folding laundry, etc). 9. Actually profiting from my projects is impossible. I take too long. 10. 80-90% complete is often good enough. So I confess my true nature to all my friends and family. 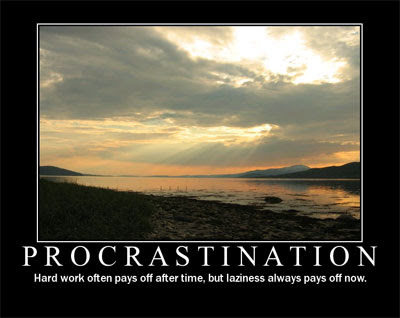 Maybe I should join Procrastinators Anonymous. But for now I will go sweep and mop my floor. It has been over a week since I actually did that. Then I think I'll make dinner. let me just say: I can relate! i am very much like you in the ways you described. i start and stop unfinished so many projects and can be sooo easily distracted by a new thing. drives my husband crazy!